Since I was a child, I have always been immersed in the colors and art of life. The more vibrant the colors the happier I am in my art. At this time I have decided to share some of my artwork that I felt would be enjoyed by those who visit my website. I enjoy taking moments in my life to slow down and play with color. The medium I use is watercolor but I am not your typical user of this type of paint. I remember, once, an art teacher telling me that I was "not ready" to work with paint when I was about 9 or 10. Glad I was a defiant child in that sense and went home and started painting without the help of a teacher. My paintings below are faceless on purpose. I had never created art in this way before but feel it's impact is greater allowing you to imagine a face or your face in what you see. I hope it gives you some way of allowing your personal creativity to come forward through your imagination. If you feel moved to purchase the works here know that each are done from the very depths of who we are, in love of the expression and we hope that our spirit has touched yours in some way through our art. Enjoy! I just created a new painting and am doing it for the Global Art Project for World Peace! You can click on the link for details of this project but basically I painted this as an exchange in peace with another randomly selected artist somewhere in the world. I wasn't sure, at first, what my concept would be. The artists involved in my area had planned to have a meeting on the 17th and I had nothing ready. For some reason this just came to me and I sketched it out within a half an hour, the morning of the meeting, so I was prepared to bring something with me about my idea and concept. I wasn't sure if this was "it" for me or not but the other artists liked the concept so I went with it. I really hope that the artist who receives this painting will appreciate it as well. 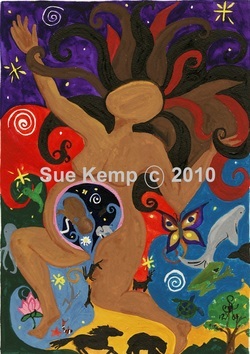 My concept was to do a painting "re-writing" the creation story of The Garden of Eden. We've all heard it at some point and I feel like this story set us, male and female, gay, straight, one race against another, one culture against another, up for conflict, power plays, and failure in our relationships. Deep, deep damage struggles within ourselves as we fight against our male and female sides within and in the balance of our planet. It kind of saddens me a lot to see this not only in my life but going back generations. I guess at this point I am finding a way to heal this within myself to have access to my own internal peace. I feel peace begins here for some reason in healing this story. This is depicting first man, first woman and their child in a balance of life. Not separated. Not clothed, but naked in their vulnerabilities. Surrounded and immersed in the benefits of all forms of life on our planet. You will see some different animals here including the snake which was so demonized in our culture by this story that I see people purposely running over snakes as they try to cross a road only to get to a better food source which helps all of us in the long run. As I read all different kinds of mythology I see so much demonizing of creatures, of women, of men and of beings that somewhere within our psyche we need to heal all of this and look at where things went wrong. Why such harsh separation occurs is beyond me but it does. Based on this we continue to separate people, of different genders, race, sexual orientation, and beings into categories and into what is right and what is wrong. I know internally I do this and so do others. If we think for a moment none of us are not biased in some manner we are sorely mistaken. We are also only tempted by our fears....Please note too that this is not about man and woman only union but also about our internal male and female and inner child. Each of us has to find a way to accept our yin and yang balance and heal the wounded child within....which represents the union of the two energies. 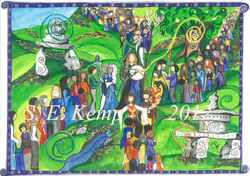 Each welcoming female ancestor in embrace to the right, open arms in the front, baby blessing in the top and holding hands to the left all represent some friends that I have in my life. I just understand some of the energy of the women I have experienced here and feel like they, as the present representation of our ancestral line, will be welcoming spirits to those that are coming home now and who will come home in the future. It just seems to flow well in that way for me and my understanding. Ganesha is the Hindu Elephant God. He is said to remove obstacles in your life. He is honored before the beginning of any new venture whether it is the building of a new house, the writing of a book, the beginning of a journey or the starting of a new business. I did just that right before I painted him. Ganesha's head symbolizes the soul, which is the ultimate supreme reality of human existence, and his human body signifies the earthly existence of human beings. The elephant head denotes wisdom and its trunk represents Om, the sound symbol of cosmic reality. In his upper right hand Ganesha holds a goad, which helps him propel mankind forward on the eternal path and remove obstacles from the way. The noose in Ganesha's left hand is a gentle implement to capture all difficulties. His fan-like ears convey that he is all ears to our petition. Ganesha also rides a mouse which signifies that one must control their ego for wisdom to shine forth. Om Gam Ganapataye Namaha is the mantra that is chanted when honoring Ganesha, so if you find yourself with a tough obstacle in your way he may just be what you need to help remove it from your life path! When painting this I really enjoyed the life coming from this figure dancing. Each with their own spirit and representing the elements coming together mixing and melding into one beautiful dance of spirit. 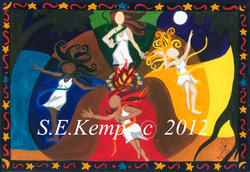 The thing about this one is it represents all of the sisters and women I have danced around the life fires with during sacred all night fire circles. The beauty and expression, some dancing in joy, some moving through pain and sorrow, some even in anger or creating majick to send out to the universe. Each in their own space, allowing the freedom to create room in their being to open to their true essence. So as you look at this you will see your sisters, your mothers, your daughters, cousins, wives, friends, your aunts, your grandmothers, or in the depths of your dreams, as your ancestors. She could be the woman who sits on the bus next to you or you work with or you see walking down the street. She could be laughing or crying, raging or just being. She is beauty, she is life, she is spirit, and she is ecstatic. She is you and she is me. 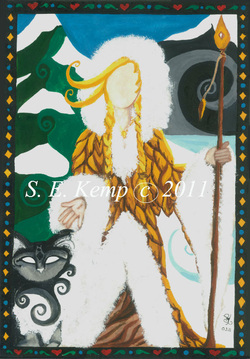 In Norse mythology, Freyja is a goddess associated with love, beauty, fertility, gold, magic, war, and death. She was known for her beauty and was a leader of the Valkyries. She had the right to claim half the souls of the bravest warriors who died in battle. Actually going onto the battlefield, she would gather them up and take them back with her to spend the after-life in her home in perpetual rest and recreation. A sweet and generous woman, she always invited their wives or lovers to come and live with them. She wore an amber necklace called a 'brisling". a cloak made of magical falcon feathers which allowed her to fly across the heavens and drove a flying chariot as well that was pulled by two cats. In the watery depths, life stirs and grows. The pushing and movement of each life as it expands creates a sense of being so full and infinite. Through the labor pains, we push and release of all creation! Each of us creates in our own way! This image was the spark to begin to paint and create artwork once again. It's sketched form sat in my attic for over 3 years until I found it one day while searching for something else. I pulled it down and in a moment of need to put color on paper I painted this over a span of days. This is available in print form only. 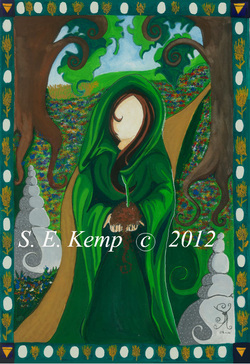 This is the newest image in the Element series, Earth. Her gift of life, nurturing and grounding in the depths of the deep dark soil. As humans we love to dig deep into the earth planting seeds of renewal! The Earth Mother feeds these seeds from deep within. rich nutrients, and new life springs forth from the rich brown earth. We plant our internal garden when we plant real gardens of all sorts on this planet. Holding dirt in our hands, allowing our toes to wiggle in it, we become automatically grounded, like the roots of a tree. We water, tend and nurture the seeds and plants as they grow. She assists us, nurtures us and allows us to grow with Her guidance and love. Ignite the passion of the flame! Fire moves and stirs us to transform the old into the new once again. Fire inspires me as you can see in my performance. I love the sense of the heat, the crackle of a winter fire or the whoosh as it spins around me. I truly honor it's elemental being in what I do. 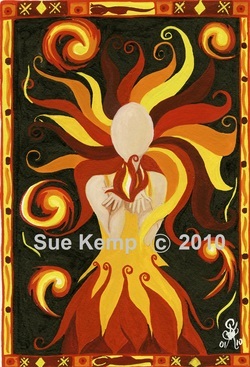 This image is part of a series of elemental paintings I am creating as I feel inspired. In a moment I was inspired by the Goddess Venus. 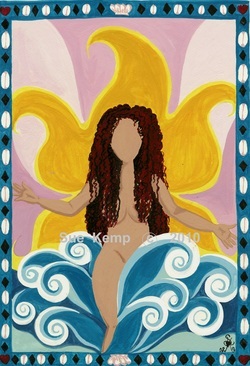 Venus is a Roman Goddess associated with love, fertility and beauty. Her deep red hair and star symbol came about because I wanted to show something different with her. She is full and open like a flower in bloom. The ocean, in it's ebb and flow, is her birth place and she steps from the depths of watery emotions of passion and love to share her embrace with the world. The original went to a dear friend who honors her in many forms. This is available in print form only.